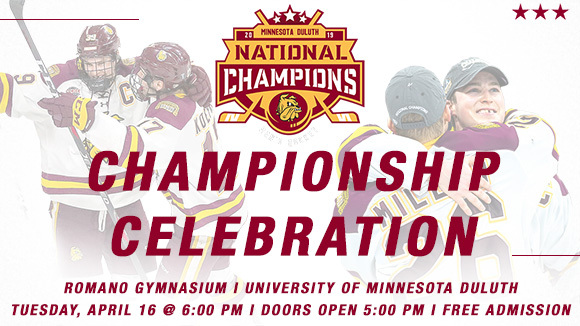 The University of Minnesota Duluth men’s hockey team, fresh off a NCAA National Championship (3rd in school history), will be honored this Tuesday, April 16th at Romano Gymnasium on campus at the University of Minnesota Duluth. 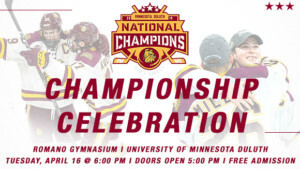 The doors open at 5:00 p.m. with a short program to follow at 6:00 p.m.
UMD players will be available for autographs and the 2011, 2018 and 2019 National Championship trophies will be on display. This event is free and open to the public. Free parking after 5:00 pm is available. For more details and information on Tuesday’s celebration event visit umdbulldogs.com/champions.